There are so many reasons why art is part of education. Deanna and Julie chat about its effect on other school subjects and its inherent value in fostering creativity, visual learning, attention to detail, motor skills, confidence, comfort with ambiguity, learning from mistakes, perseverance, and communication with others. We start off with a big picture overview and a discussion on the current dilemma in art education: should we argue to keep art in schools because of the effect the arts seem to have on other school subjects, or should we focus our efforts on pointing out the inherent positive effects art has on life? We cover both in this podcast. I believe art ’causes’ improvements in behavior, character, and grades because our whole being needs that balance between the ridged academic subjects and the more creative subjects, just as our physical bodies need both physical activity and rest. The arts can also make learning other subjects easier because of the different modes of learning they employ. For example, drawing is both a kinesthetic activity and a visual activity, facilitating both of those methods of learning. Project Zero’s “Reviewing Education and the Arts Project” (REAP) Executive Summary. Harvard. Art isn’t creating creativity because we’re already creative beings. Instead it’s exercising our creative muscles and helping them grow stronger. As we teach our students, we give them all the tools and techniques they need. Then we give them time to try out, perfect, and experiment with what they’ve learned. It’s during the time for play that we foster creativity. Betty Edwards, in her book Drawing on the Right Side of the Brain, noted that once someone learns to think and see creatively, that skill carries over to all areas of their life. For example, in her experience, teaching an average office worker how to draw, results in the ability to think up more creative solutions at work. Learning to draw is all about learning to see and notice details. It’s hard to develop the skill of seeing/noticing the details, but drawing teaches you that. I love how drawing while traveling helps me notice more and enjoy the whole trip more. Attention to detail is important for many different subjects and careers! The fact that drawing helps you notice details is explained well in the “Look at Your Fish” story about the budding scientist who wasn’t able to really see the details of the fish he was studying until he started drawing it. Malcolm Gladwell also talks about the way the brain works in his book, Blink. He discusses how, after years of paying close attention to details, the subconscious will make use of vast amounts of information and help you make informed decisions, even if the conscious brain doesn’t really know what’s going on. It’s one thing to grow in confidence because you got the exact same answer to a math problem as everyone else, but it’s another layer of confidence when you create a drawing or painting, see how it’s a little different from everyone else, and see that it’s what YOU wanted it to be. When you get to the point that you can look at a set of directed drawings and say “I like mine best,” that’s a whole different level of confidence. “What nobody tells people who are beginners, and I really wish somebody had told this to me, is that all of us who do creative work, we get into it, and we get into it because we have good taste. But it’s like there’s this gap. For the first couple years you make stuff, what you’re making isn’t so good. It’s not that great. It’s trying to be good, it has ambition to be good, but it’s not quite that good. But your taste, the thing that got you into the game, your taste is still killer. And your taste is good enough that you can tell that what you’re making is kind of a disappointment to you. You know what I mean? A lot of people never get past that phase. A lot of people, at that point, they quit. And the thing that I would say to you with all my heart is that most everybody I know who does interesting, creative work went through a phase of years where they had really good taste, and they could tell what they were making wasn’t as good as they wanted it to be. They knew it fell short. It didn’t have this special thing that we wanted it to have. And, the thing I would say to you is, everybody goes through that- and for you to go through it, if you’re going through it right now, if you’re just getting out of that phase, you gotta know, it’s totally normal. Anytime you’re doing something challenging and you stick with it, you’re growing your whichever literal or figurative muscles you’re using. The book, Willpower Instinct, by Kelly McGonigal, talks about how willpower works the same way- it’s like a muscle in the brain. Looking at a particular culture’s art helps you understand that culture. This is true for ancient civilizations as well modern-day cultures. 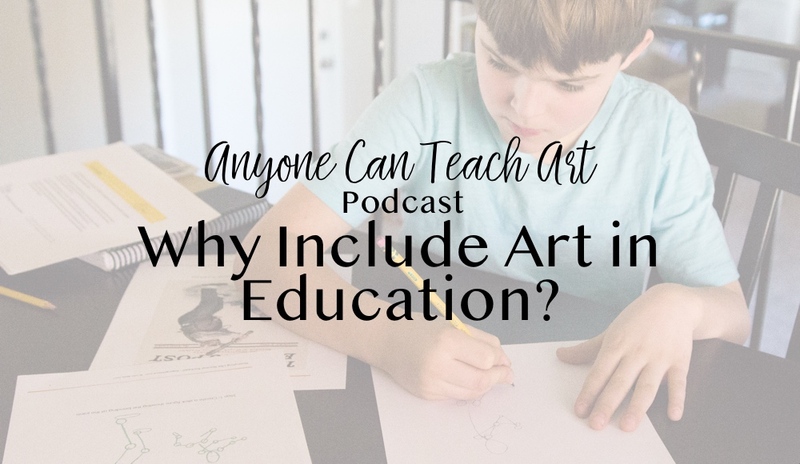 We hope this podcast inspired you to keep including art in your student’s education. Did you think of something we missed? What advantages do you see when you work some art into school? Next week, we’ll be chatting about the Classical Model of Education and how it relates to art!